SAEM high school workshop attendees are pictured at Stage AE with Assistant Professor Ed Traversari (far left) and Red Caiman Media owner and head engineer Jesse Naus, (far right). Penguins hockey fan Amber Montz always wanted to attend college in Pittsburgh. Her interest grew after watching a commercial about Point Park University on ROOT Sports at home with her dad in Fayetteville, N.C.
"We decided to check out Point Park's website and came across the sports, arts and entertainment management major. I knew this was something I wanted to do so I applied the next day," said Montz, who graduated from Terry Sanford High School and will be a freshman SAEM major this fall. 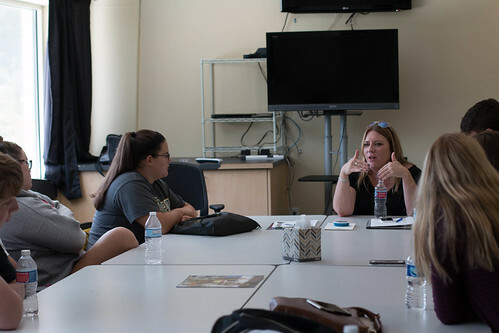 Montz, along with several other incoming freshmen and high school students, attended the July 20-22 SAEM workshop which covered sports and entertainment law, the live entertainment business, venue and facility management, public relations and marketing, performing arts management and more. "We were very pleased to host such a great group of students passionate about our business," said Steve Tanzilli, J.D., SAEM associate professor and chair of the Department of Management. "What really interested me was the workshop's itinerary, spending the entire day backstage at Stage AE, touring the Benedum Center for the Performing Arts and meeting with SAEM faculty and future students," remarked Jaron Andrechak, a graduate of Charleroi High School and incoming Point Park SAEM freshman. "It was great to get a jump start on everything." "We had a terrific discussion at the Benedum and got to watch part of a light focus for an upcoming Pittsburgh CLO show," explained Teresa Gregory, M.F.A., CFRE, assistant professor of SAEM. Additional highlights of the three-day workshop included guest speakers Jesse Naus, owner and head engineer of Red Caiman Media, and Amy Cooper, director of marketing for Stage AE. Naus talked to the students about the recording industry business and Point Park's new record label, Pioneer Records, while Cooper discussed her strategies for marketing concerts held at Stage AE. "The workshop was phenomenal! I enjoyed learning about the SAEM program from the professors and discovered that this is the career path I want to pursue," said Georgia Fowkes, who will be taking Point Park's SAEM 101 course at Montour High School this fall. "As of right now, I'm strongly considering Point Park."